In recent years there has been much concern about the safety of nuclear installations in Central and Eastern European countries (CEEC) and the Newly Independent States (NIS). The enhancement of such safety has been a focal point in the discussions on enlargement of international organisations such as the EU, OECD and NATO. 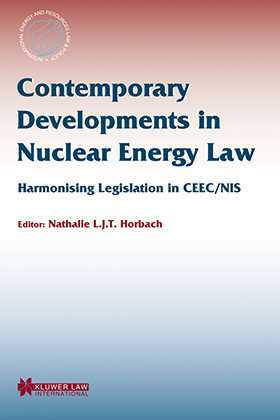 Contemporary Developments in Nuclear Energy Law: Harmonising Legislation in CEEC/NIS provides an overview of the latest legislative developments concerning nuclear safety and liability in the CEEC/NIS, as well as an analysis of related international and national legislative, financial and technical initiatives. The objective is to bring together the various approaches of academic, governmental, industrial and CEEC/NIS expertise. Special attention is given to the recently adopted 1997 Protocol to Amend the Vienna Convention, the 1997 Convention on Supplementary Compensation for Nuclear Damage and the 1997 Joint Convention on the Safety of Spent Fuel Management and on the Safety of Radioactive Waste Management. Several case studies highlight certain nuclear liability or safety-related developments and experience in several identified CEEC/NIS, inter alia, Lithuania, Russian Federation and Ukraine. This is placed within the context of an overview of international and independent assistance programmes and `Memoranda of Understanding' established by industry and various organisations, such as the EU, the EBRD (Nuclear Safety Account), the IAEA and the OECD Nuclear Energy Agency.